A bumper pack of 375 French reward stickers, supplied with a handy plastic storage case. Perfect for busy teachers who need lots of French stickers but aren't fussy about which designs they receive! This is a mixed pack of 375 stickers of at least 15 different, assorted designs that will include an assortment of phrases*. *Designs may differ slightly from those shown in the illustrations above. These French reward stickers are essential for every primary MFL teacher! They are an ideal size for children to stick onto their clothing. 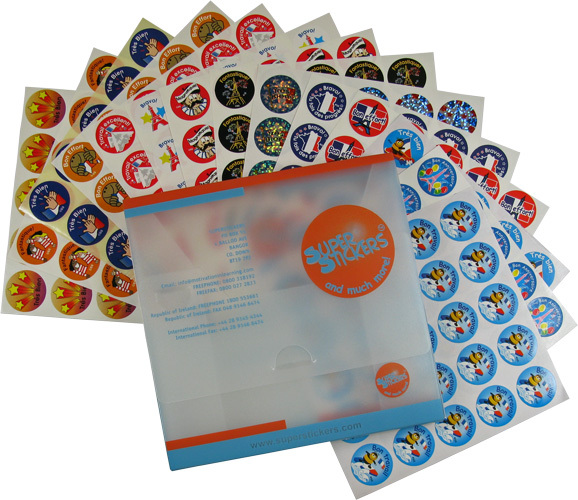 Very nice stickers, the children in schools love them! I received the pack in seven days and children adore the stickers. So happy ! A perfect 'starter' pack to complete as you go along. Love the box to keep them safe too. I am using these stickers all the time, my pupils are very proud to win them... it pushes them to participate more! The children love being rewarded with these stickers. There is a good variety and they are well designed. The handy case to keep them in is a really good idea.